During the Elizabethan period, the employment of Africans became increasingly common in England. They served in wealthy households as footmen or musicians, and the queen herself retained a black maidservant. But during the 1590s, Elizabeth issued a series of proclamations ordering the expulsion of black people from her realm. They were increasingly used as scapegoats by the queen and her ministers for the social ills that dogged the later years of her reign. The harvests repeatedly failed, which brought hunger and disease, and sparked a sharp rise in poverty and vagrancy. 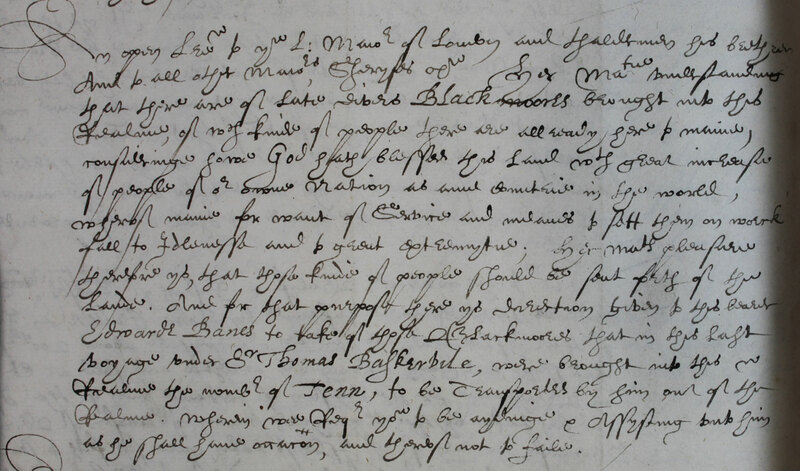 Fearing disorder and a breakdown of society, in 1597 Elizabeth passed an Act for the Relief of the Poor. This was followed by a similar act four years later which created a national poor law system for England and Wales. An open le[tt]re to the L[ord] Maiour of London and th’alermen his brethren, And to all other Maiours, Sheryfes, &c. Her Ma[jes]tie understanding that there are of late divers Blackmoores brought into the Realme, of which kinde of people there are all ready here to manie, consideringe howe God hath blessed this land w[i]th great increase of people of our owne Nation as anie Countrie in the world, wherof manie for want of Service and meanes to sett them on worck fall to Idlenesse and to great extremytie; Her Ma[jesty’]s pleasure therefore ys, that those kinde of people should be sent forthe of the lande. And for that purpose there ys direction given to this bearer Edwarde Banes to take of those Blackmoores that in this last voyage under Sir Thomas Baskervile, were brought into this Realme to the nomber of Tenn, to be Transported by him out of the Realme. Wherein wee Req[uire] you to be aydinge & Assysting unto him as he shall have occacion, and thereof not to faile.